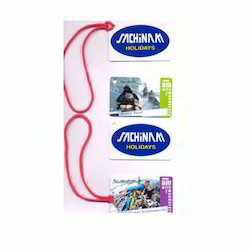 Professional travel tags luggage tags with customised designs. Ideal for travel agencies, tour companies to give to customers. Made from wood with digital printing and plastic loop tag. Traveling Tags can be personalized with any picture and names. Travel tags all cartoon characters available. •47 stickers in one tin. •Size : 61mm × 111mm approx. •Comes in a collectible tin case. •2 designs, shipped randomly, or order 2 and we`ll send you both.